Pickleball is one of the fastest-growing sports in the United States. This popular game takes the best elements from games like tennis, badminton, and ping pong, and combines them into an inventive new activity that’s fun for the whole family. A pickleball set (unlike a paddle set) will include everything you need to start playing. This means you’ll be getting a set of paddles, balls, and a net to play with, rather than purchasing the pieces separately. These sets are perfect for beginners. If you’re looking to introduce pickleball into your life, we’ve compiled reviews of the best pickleball sets (and shoes, here) to help you get started! Also, if you’re interested in game sets for other sports, check out our Best Flag Football Sets article! This set ranks up there among the more expensive sets you can get as a beginner and – though it’s made with quality materials – it tends to receive slightly lower reviews than some of the other options in the same price range. It comes with four “Kanga Wood” pickleball paddles with wrapped handles and wrist straps. The four balls that are included are regulation Jugs Pickleballs, along with these is a carrying case with pocket space for balls and paddles, and a printed copy of the rules of the game. Nets can, unfortunately, be the weakness of pickleball sets, often made with cheap materials that fall apart easily. Luckily, that’s not the case with this set! The net is where this product makes up for its high cost, as it comes with an official Pickle-Ball, Inc. 3.0 Portable Pickleball Net System – one of the most popular pickleball nets on the market. This lightweight net sets up in only 5 minutes with minimal effort. It features a wide, bent-leg net frame of powder-coated steel to increase stability and durability. The Easy Buckle net tension system allows you to get a tight net set up quickly and easily. Addition of the 3.0 Portable Pickleball Net System made of quality materials and easy set-up. Regulation pickleballs are durable and ready for play both inside and outside. The handy carrying case has additional pockets for keeping your pickleball supplies organized and easily accessible. JOIN THE FUN- pickleball is America's fastest growing sport, start playing with your own portable set! If you’re on a tight budget and the more expensive options aren’t in your best interest, the Verus Sports Complete Pickleball Set is something to consider, as it’s significantly less expensive than its competitors. 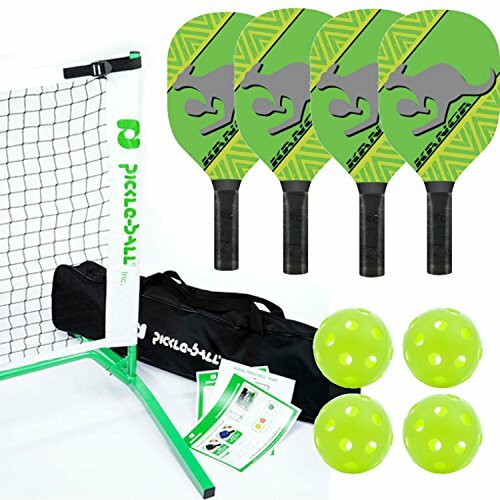 Although its low price brings a couple of drawbacks compared to the more expensive versions available, it still contains everything you need to get started playing pickleball! This set includes four multi-plywood paddles with a charmingly simple Pickleball-themed design. The paddles are unwrapped, so they include no additional grip and feature wrist bands to prevent you from losing your paddle accidentally. The set also includes three white pickleballs, but unfortunately doesn’t include a carrying case. The main difference between the Verus Sports Set and the others on this list is the type of net it comes with. Unlike the other nets, with their wide-bend metal legs, you’ll need to fill the base of this net with either water or sand in order to stabilize it. This makes the net more lightweight for transportation, but significantly heavier once it’s filled. To set up the net, you have to snap together the metal frame and slide the net over it. A common complaint of this product is that the frame isn’t strong enough to support the net without bending and requires additional support. It’s nothing some creative jerry-rigging won’t fix, but it’s also not an issue you’ll have with the more expensive sets. The Verus Sports Set is great for beginners on a budget, who aren’t ready to invest too much into the game. It has some fixable flaws with the products, but it will still certainly show you, your friends, and family a great time! The affordable price makes pickleball more budget and beginner-friendly. Extra lightweight design makes it easy to transport and play anywhere. 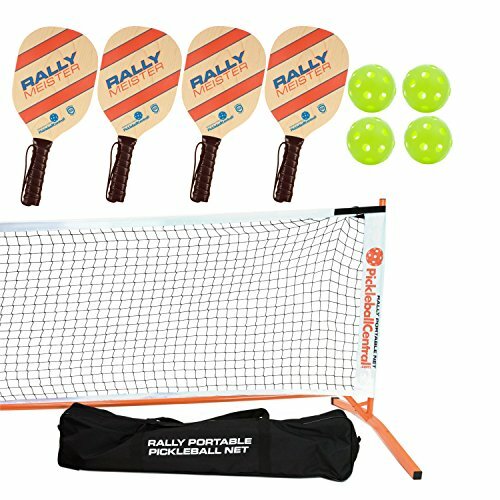 The Rally Meister Pickleball Set is a great option for any family (or group of friends) looking to get into pickleball. It includes four Rally Meister wooden paddles, four Jugs pickleballs, and a useful rule set. The paddles have wrapped handles for added grip and wrist straps for extra safety. The pickleballs are designed for indoor play but work just fine for outdoor play as well. 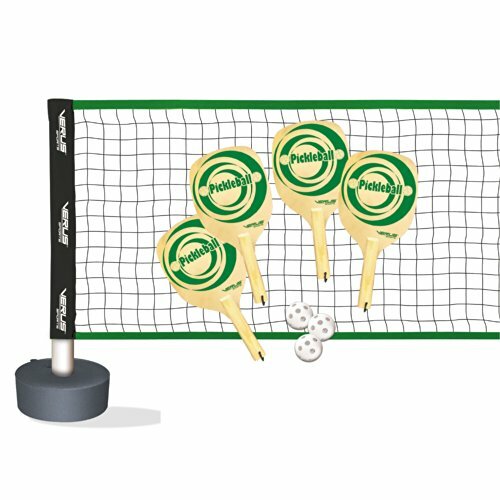 Since our goal is to bring you the best options to choose from, this is another set that comes with the Pickle-Ball, Inc. 3.0 Portable Pickleball Net System! With this system, you know you’re getting a high-quality wide-based, metal-framed net that goes together quickly with minimal drooping in the center. This set comes with a convenient (and stylish) carrying bag with pockets for organizing your balls and paddles. It’s got everything to get your game set up and started quickly, so you’ll be playing pickleball before you know it! Although it’s a little bit of an investment, this is the best Pickleball set you can get if you’re looking to have endless hours of outdoor fun with family and friends. It has everything you need to play, all made from high-quality materials, and is manufactured by the creators of the game itself! The Diller Set includes four hardwood paddles with wrapped handles for increased grip. The paddles are Diller’s most popular model for casual play and are made from seven-ply maple, weighing in between 9.0 and 10.6 ounces – making them sturdy but lightweight enough for people of all ages to use them. Like the Kanga and Rally Meister Pickleball Sets above, the net included with this set is one of the most popular standalone models you can buy, the Pickle-Ball, Inc. 3.0 Portable Pickleball Net System, featuring an easy snap-together metal frame to maintain net tension and wide legs with a bent design to keep the net sturdy and give the balls space to roll underneath easily. The 22-foot wide, adjustable net is made of black mesh with white binding on the sides, top, and middle. This set also includes four Jugs Indoor Pickleballs – though they can be used for outdoor games, too, without any problem – as well as a stylish carrying case with extra pockets to easily store your balls and paddles. A copy of the rules is also included in this set. If you’re just getting started in pickleball and you want a set that’s going to last you a long time, you can’t go wrong with this set. It’s a little more expensive than some of the other options, but with the expense comes a higher-level quality, as evidenced in the many glowing reviews you can read on Amazon! Easy buckle-tensioning system for the net allows you get a tight net set up easily. Metal net frame ensures there won’t be any sagging and holds up well on windy days. Comes with four high-quality seven-ply maple paddles. Pickleball is a family game that was, unlike many modern family games, actually invented by a family. It originated on Bainbridge Island (located near Seattle in Washington State) when a group of congressmen went home in the summer to find their children bored. They decided to create a new game that would keep the kids (and, as it turned out, the whole family) occupied. They took table tennis paddles and a whiffle ball outside and lowered the net of their badminton court, making up the rules as they went. It was a hit with everyone and quickly spread throughout the island, and today the sport has made its way around the world. It’s estimated that over 2 million people are playing in the US alone. Pickleball is played on a badminton-sized court and the rules are designed for maximum fun, meaning that some of the elements that would lead to aggressive competition have been removed. This means that before you can start volleying the ball back and forth, it has to bounce twice: the first time is when it’s served, and the second time is when the ball hits the servers’ court on its return. This is called the “Double Bounce Rule.” Once those initial bounces have occurred, players can volley the ball without waiting for it to hit the ground. There’s also a seven-foot-long zone on either side of the net which cannot be played from to prevent players from spiking the ball. Stepping into the no-volley zone is a fault, which we’ll talk more about later. In pickleball, the serve is meant to travel diagonally across the court; so if you imagine the court is divided into four squares, you’re aiming your serve to the one diagonally from you. It doesn’t matter if you’re playing doubles or singles for this rule. Your serve has to land outside of the no-volley zone before your opponents can hit it off of the bounce. If this sounds confusing, there are some great diagrams here. As far as form goes, the server has to stand behind the back line of the court and serve underhanded, without letting the ball bounce on the ground first. The paddle and the ball should connect below the waist. Here’s a great video breaking down what makes a good pickleball serve. The serving team switches whenever the current serving team faults, or breaks the rules in some way. The only exceptions are the first fault of a given game, which doesn’t result in a turnover. So the starting team can fault once but on the second fault the serve switches. The other exception is if the ball hits the net but still manages to land in the playable zone, somehow clearing the no-volley zone. Then the serving team is allowed a do-over. Faults, which result in the serve changing to the other team, occur when a player breaks the rules. Touches any part of the no-volley zone, even if it just touches the line. Fails to clear the net. Is volleyed from within the no-volley zone. Is volleyed before the double bounce rule has been completed. There are a few more faults if you’re playing competitively, and those can be read in more detail here. The winner is the first person, or team, to arrive at 11 points with a two-point lead. So if you score 11 but your opponents have 10, you’ll have to play until a two-point lead is established before you can do your victory dance. All of the inclusive pickleball sets you can buy will come with wooden paddles. Wooden paddles are generally the heaviest paddles you can get and they’re cheaper to manufacture and buy, so they’re a great option for when you’re just getting started and want to see how you like the game – or if you’re introducing others to it. Composite: Composite paddles are increasingly popular amongst pickleball players. Typically they’re made with a composite core and either fiberglass or carbon fiber hitting surfaces. The textured surfaces make it easier to put some spin on your ball, and the different cores available will also have an impact on your play. You can find more information about that here! Graphite: Graphite paddles are the lightest paddles you can get. They’re made with a very thin layer of graphite over the core. Much like the composite paddles, the core material changes the way the ball responds, so check out the guide linked above. These are especially popular with competitive players because the graphite face has a quick action. Net quality has tended to be a weak spot in pickleball sets and it’s a tragedy because a flimsy net can really affect the quality of gameplay. Fortunately, that’s changing as pickleball grows in popularity. Three of the four reviewed sets on this list include one of the highest-rated nets on the market at the moment. What you’re looking for from your pickleball net is something that is going to last without sagging and is quick to set up, so that you don’t spend twenty minutes struggling before the game can even begin. When deciding what kind of ball will suit your needs best, consider whether you’ll be playing primarily on an indoor court or an outdoor court. Balls designed for indoor play tend to be lighter weight, softer, and easier to control in gameplay. They typically have fewer holes than their outdoor counterparts and wear out more slowly. Outdoor balls are heavier and harder, with smoother plastic. They’re harder to control but easier to hit. Because of their weight, outdoor balls are less likely to be affected by the wind, though they tend to break or distort more easily because of being used on harder surfaces than indoor balls. Most of the sets on this list come with Jugs Indoor Pickleballs, which are the most popular brand of indoor balls and are frequently used outside as well, for the simple reason that they’re easier to control for extended volleys. Do I Need a Set? If you’re new to the game and want to get a set that can be used by your whole family, sets are a good and hassle-free option to get all the materials you need in one place and at one time. Although most of the sets on this list come with quality materials, if you’re looking to jump in with the best you can buy, it’s better to build your own set so that you can get better quality paddles and have more control over what equipment you’re starting out with. It really depends on what you’re looking for, but you can gather a quality pickleball set all on your own! Pickleball Central: Pickleball Central is the creator of both the Kanga and Rally Meister brands. They’re a family-owned company with a passion for pickleball and they bring that passion to both their products and their customer service. Verus Sports: Verus Sports is a family-owned and operated country which has been manufacturing outdoor games and activities for over 40 years. Pickle-Ball, Inc.: Pickle-Ball, Inc. is the company started by the creators of the game to meet the growing demand for pickleball products. Since its founding, the company has been singularly focused on helping the game grow by creating the highest-quality materials and sponsoring all kinds of pickleball events. Keep in mind, these sets are designed for people who are new to the game of pickleball. If you’re an experienced player, you probably want to look for pickleball equipment that is suited to your play-style and preferences. 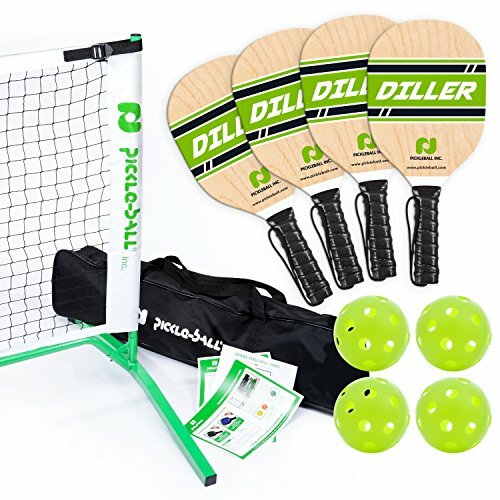 If you’re a beginner, then I can’t recommend the Pickle-Ball, Inc. Diller Set enough. It’s more expensive, but filled with high-quality equipment and comes from the company that started it all. It has everything you need to get out and start playing, and if our recommendation isn’t enough, their Amazon reviews are full of praise! We hope you found our article helpful on how to find the best pickleball set for your backyard gaming needs!